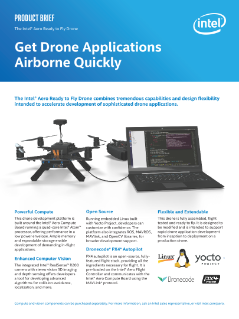 This drone development platform is built around the Intel® Aero Compute Board running a quad-core Intel Atom® processor, oﬀering performance in a low power envelope. Ample memory and expandable storage enable development of demanding in-ﬂight applications. The integrated Intel® RealSense™ R200 camera with stereo vision 3D imaging and ...depth sensing oﬀers developers a tool for developing advanced algorithms for collision avoidance, localization, and more. Running embedded Linux built with Yocto* Project, developers can customize with confidence. The platform also integrates ROS, MAVROS, MAVlink*, and OpenCV* libraries, for broader development support. PX4 autopilot is an open-source, fully-featured ﬂight stack, providing all the ingredients necessary for ﬂight. It is pre-loaded on the Intel® Aero Flight Controller and communicates with the Intel® Aero Compute Board using the MAVLink* protocol. Get a look inside the highly integrated drone platform enabled with flexible connectivity and computer vision.